Hey puppers, kittehs, and my other anipals! You guys knows I loves me some FREEZE DRIED FOODS! ONLY NATURAL PET FREEZE DRIED RAW NIBS! I don't knows....what can you tell me abouts this Ma? 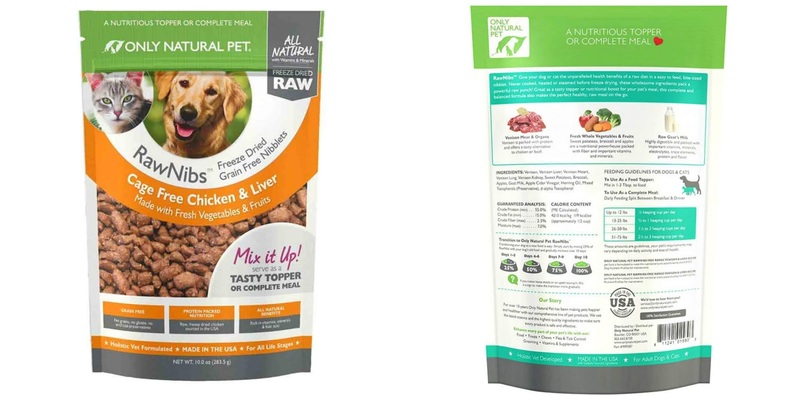 Only Natural Pet RawNibs offer unparalleled health benefits of a raw diet in pawsome bite-size pieces (each nibblet is about the size of a dime). They are never cooked, steamed, extruded or heated. This optimizes nutrition, flavor (oh, they are good pals! ), and health benefits. Each flavor: BEEF, VENISON, CHICKEN and WILD SALMON and COD, are of the highest quality! Since they are freeze dried, they are packed with protein, amino acids, essential fatty acids and digestive enzymes. Ma started me off with about a 1/4 cup, or a handful over my full bowl of kibble. Proof is in the empty bowl! BOL!! ONLY NATURAL PET FREEZE DRIED RAWNIBS! Disclaimer: I was given two bags of this food to try out. No green papers, diamond studded collars, or Maserati's were given in exchange for my review. All opinions, slobbers, and snots are my own. That looks yummy and I love your pretty pink bone foodables stand, Ruby! BUUUUUUUUUUUUUUUUUUUUUUUUUUUUTTTTTTTTTTTTTTTTT IT LOOKS LIKE YOUR MA COUNTED OUT EXACTLY HOW MANY TO PUT IN YOUR BOWL. I can tell you right now this kit kat does not like to see the bottom of her kibble bowl. omcs all I see on yours is White!! We can tell you loved that food Ruby. You did a great review. Those look like they make a really good topper for your kibble, we love toppers! Pawsome review Ruby...these foodies look totally delish!! We tried some of Only Natural products and we think they are a great company. Your empty bowl attests to how much you liked that freeze dried food. We hope your trial test goes very well. Fabulous review Ruby!! We have not yet tried those, but judging by the looks of your bowl...they must be really tasty!! You had us at food! That sounds really tasty and we love Only Natural's other products. Chicken AND liver? Oh man, you sure know how to pick food combos, Ruby. Enjoy that awesomeness! Sounds yummy! I kind of love the name too - Raw Nibs. I want some raw nibs right now!